"Many dark and sleepless nights have I been a companion for owls, separated from the cheerful society of men, scorched by the summer's sun and pinched by the winter's cold - an instrument ordained to settle the wilderness." 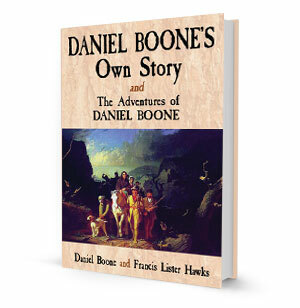 Trailblazer and legendary hero Daniel Boone fearlessly explored the early American frontier. Motivated by a powerful sense of purpose, Daniel Boone blazed the Wilderness Road through the Cumberland Gap. Thousands followed, settling in Boonesborough, Kentucky, to form one of the first English-speaking communities west of the Appalachians. Boone writes surprisingly well for someone of not much education and you get to experience first-hand discoveries of the Kentucky wilderness. The biography which follows helps fill in the rest of his life and some missing details. If you like first-hand accounts of real adventures, you will love this! 128 pages of the life & times of Daniel Boone. Daniel Boone - an American pioneer, explorer, and frontiersman. His adventures were influential in creating the archetypal hero of American folklore. Still a great read over 200 years later.